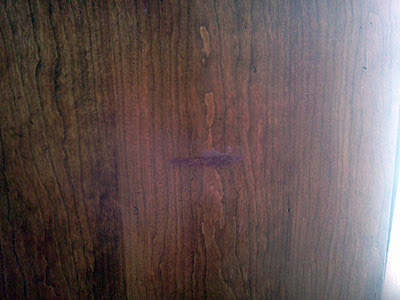 ﻿ A long time ago, I bought this armoire from a gay couple who lived near Loyola University. I mention this to shatter stereotypes; these guys were not only slobs, but they let a fine piece of furniture like this get scratched. The door has a key which when opened, rubs against the side. Somehow over the years, this had carved a small line across the side panel. For years I've lived with the scratch because you really cannot see it unless the doors are closed AND you are sitting to the right of it, which with most of the furniture configurations I've gone through wouldn't be practice for TV viewing. But now that I've got a little time on my hands and the desire to fix everything with tools, I decided to take a crack at repairing it. The good news is that unless I really goof up, I cannot make the situation any worse. The first thing I I did was tried to sand it down a little. I figured this might be unnessary for this project but everything I researched (two articles on the internet) about fixing these kinds of scratches said that you want to sand the surface so your putty has an nice even surface to adhere to. And I figured it would be an good excuse to use the Dremel Trio I got for Christmas. Remember what I said about not making it worse? Well I almost went Tim-the-Toolman on it, but luckily I realized quickly that wasn't helping and stopped before the scratch got too wide. Even with just a piece of sandpaper I found I was doing more harm than good so I moved on to the next step. For that we need our good friends Wood Putty and Wood Finish. 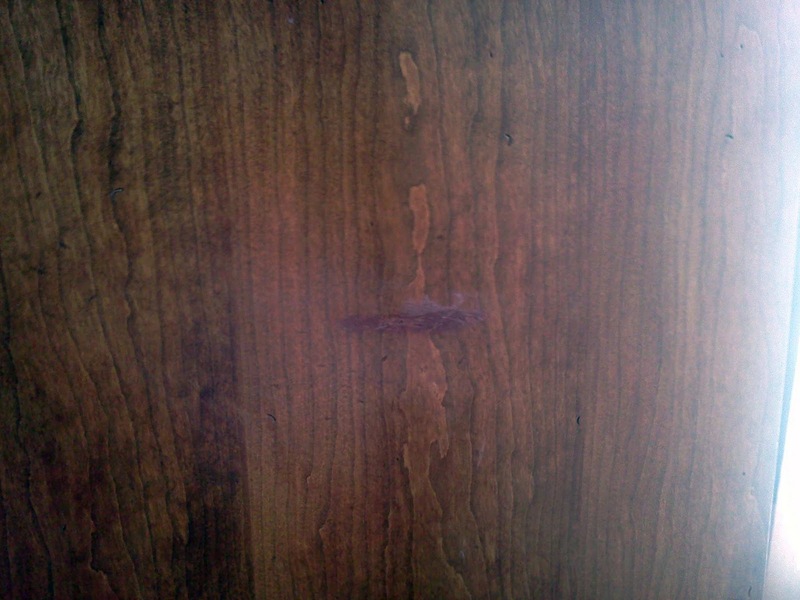 A trip to the nearby Crafty Beaver yielded Red Mahogany Wood Putty and Red Oak wood stain. These are as close to matching the armoire as I can find and again, as this is on a side that doesn't face the world, it doesn't matter if it's not perfect. For a second hand armoire that is serving as a entertainment center, this less than $5 solution works well in terms of concealing the scratch and blending in with the veneer. Sometimes a simple solution is better than going all out.